A lot of the time we get things wrong but sometimes, just sometimes, people just get things right..You know.. Like the bloke who invented the internet or Mr Guinness the inventor of, well, Guinness. Mick and Lee at Longhorns have hit on a concept that is both well timed and well conceived. Basically we all have our inner caveman and short of clubbing our prospective mate over the head and dragging them back to check out the etchings on our cave wall what else is it we crave?… Meat and fire!!! I was lucky enough to come across Longhorns on Moseley Street a few months ago but such is the popularity of the central Newcastle restaurant that the people of the North East demanded more and like a phoenix from the burning embers of a barbecue pit, up rose the sister or should I say Big Brother Restaurant on Osborne Road in Jesmond. If the Moseley Street restaurant was a little doughey eyed calf….. Longhorns in Jesmond is a dirty great big Aberdeen Angus. One of the benefits of being a bit of a foodie w***er is that you get invited to go to these places and write about them (It’s a hard life!) So I tripped along there with a few fellow work carnivores for the opening night last Saturday. The place was understandably heaving. Live band in the corner, free beer on tap and once sat at our table a heart stopping collection of beef long-ribs, smoked sausage, pulled pork, pulled brisket, pork ribs, chicken wings, crispy pork rind, pit beans, fries and slaw… You know those STFU moments when something good has just happened and nobody speaks. Well take a bow Longhorns that is exactly what happened, swiftly followed by a blur of hands and forks tucking in! The guys in all honesty didn’t have the whole place up and running yet but I have no doubt the best is yet to come. Private dining: More of the same great food with a beer font smack bang in the middle of your table to serve yourself (stick a bucket under the table lads and I might move in!) That’s… A beer pump on your table! Why cant you buy those in Ikea? The Slaughterhouse Take away: If you’ve never heard of Katz Deli in New York Google it. Its like a sandwich shop on steroids. Great big meaty Reubens, Smoked Turkey, Pastrami, Brisket and Corned beef. The kind of sandwiches where you wish you had a dislocatable jaw to get more in your mouth. How would you like one of those places in Jesmond? Boom its happening in the Longhorns Slaughterhouse. Take away meat and big sarnies. 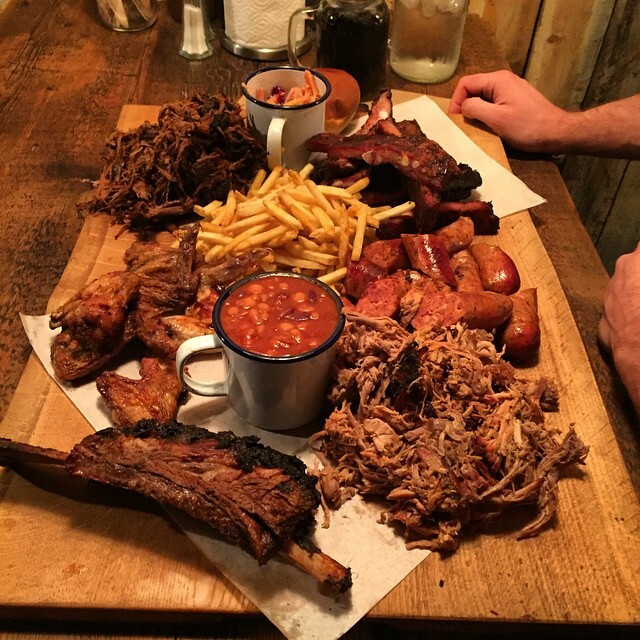 I can feel a meat coma coming on! And last but by no means least the small matter of a potential salt lick fire pit for some al-fresco dining later in the summer. Its enough to make you weak at the bladder. So as I said at the start, some people just get things right. Well done Longhorns I tip my Stetson and charge my glass of Knob Creek to you! Longhorns is just off Holly Avenue West where the old Firenze was. I urge you to pay a visit.